The Viewer is an interactive, read-only version of your Mind Map, shown in a web browser. You can expand and collapse branches, zoom in and out and pan around, as well as view notes and click on any website links attached to your map. In order to share your Mind Map you must first create a public link to it. That link, you will then be able to send to anyone who you want to see the map, whether they have iMindMap or not. It is as simple as that! The steps outlined in the video below will show you how to create this link. Watch the video below to find out exactly how to embed your Mind Map. You can use this feature for site-maps or as an easy-to-navigate resource library, as visitors will be able to access other webpages or documents simply by clicking on the branches of your Mind Map. Once embedded in your website you will have something that looks like this. You can left click and drag on the map to move around it and use your mouse wheel (if you have one) to zoom in and out, or alternatively you can use the buttons at the bottom of the viewer. 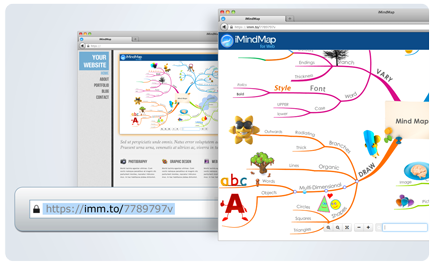 We hope you enjoy using the iMindMap Viewer. Get sharing those Mind Maps! If you have not yet experienced all the fantastic new features available in iMindMap 6.2 then you can trial them for free here.